FINALLY FINISHED ONE OF MY DREAM BIKES FROM BACK IN THE DAY. 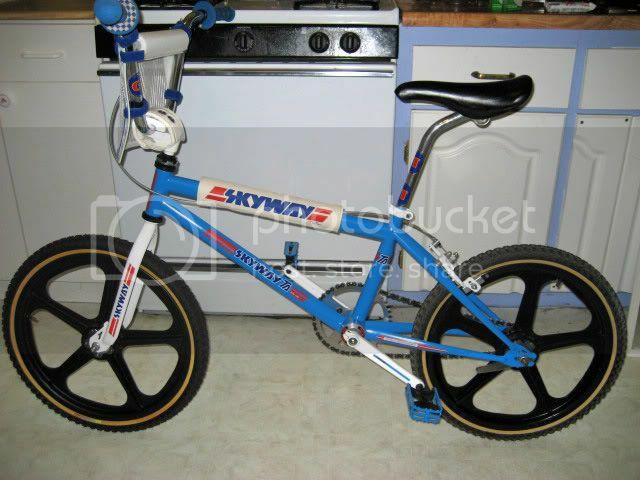 That Skyway looks stunning in Blue, don't see many of those. That's awesome. It looks great in blue even though I am partial to the white ones. What's the story with the color combo? And nice drivetrain set-up. 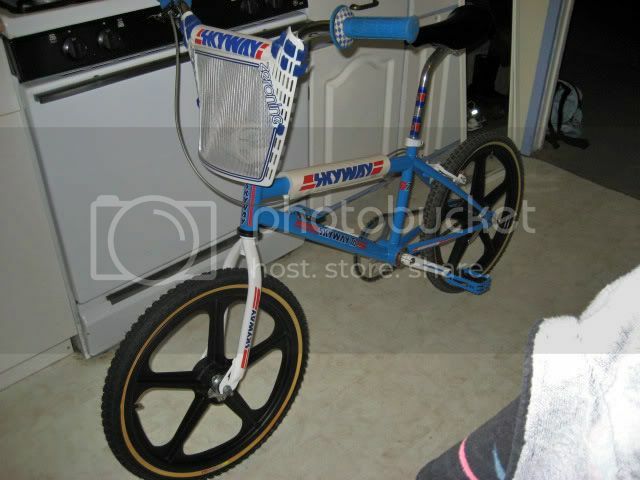 Those are Skyway pedals right? 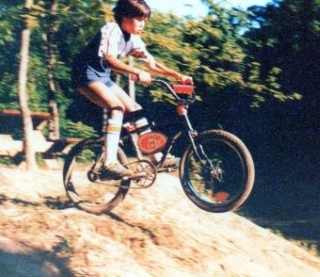 Also, is it a rider, I see it's an XL with a laidback GT seatpost? And not to get personal, but how do you like Escondido? My wife is from West L.A. and we talked about retiring in Northern San Diego. Seems like Escondido would be great. hey,dose any one have a cool streak,hot streak,viper or strike zone?please tell me if so. Spoken like a true So Cal. I used to live in Santa Clarita. Do you use cruise control? Anyone have info on North Dakota??? wow very nice I like that blue I might do that blue on my hutch like you just to be alittle different but you know hutch there mostly chrome so not sure yet. old school vintage collecting is an addiction!!! hey guys i finally took this out for a ride at mission beach with a bunch of other oldschoolers. rides pretty good. 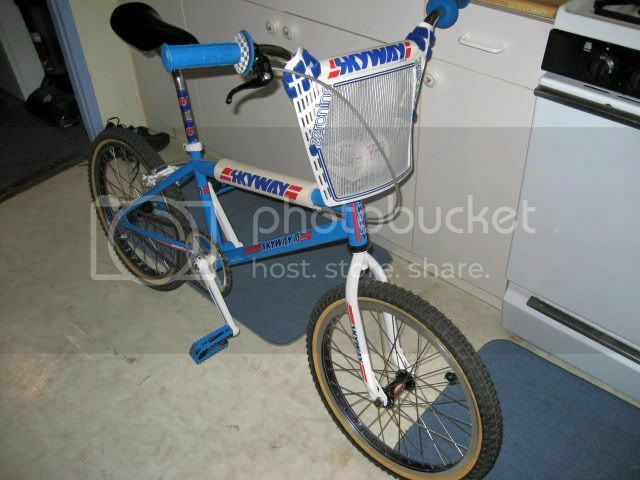 Wow its a classic, I cant find skyway gear or pads anywhere. thanks for the kind words but truth is i was gathering parts for this for about a year. just got lucky and found the stuff when i was looking for it. ALWAYS TRYING TO CHANGE THINGS AROUND ADDED UKAI DECALS TO RIMS AND A FRESH NOS TANGE 125LP HEADSET HOPE YOU LIKE IT. hey guys my wife got me these tuff IIs for valentines finally got them so i put them on to see what it looks like with mags......i am actually going to use these on my 1980 team mongoose that i am working on. really nice build , i like how you switch it up. i like the bullseyes hubs they kind of put the build over the top. whats with the T/A XLs in funny colors? I want to apoligize in advance for not reading the entire thread or doing any research whatsoever before i post my comments. SWEET! It's cool to see the T/A's in different colors, even though I am a fan of the white. "Time is a great teacher, unfortunately it kills all it's pupils"
You r like a genious but different.LOL I like it man, it's cool and it mixes things up a bit. that is a really sweet ride...love it! What is and what should never be! 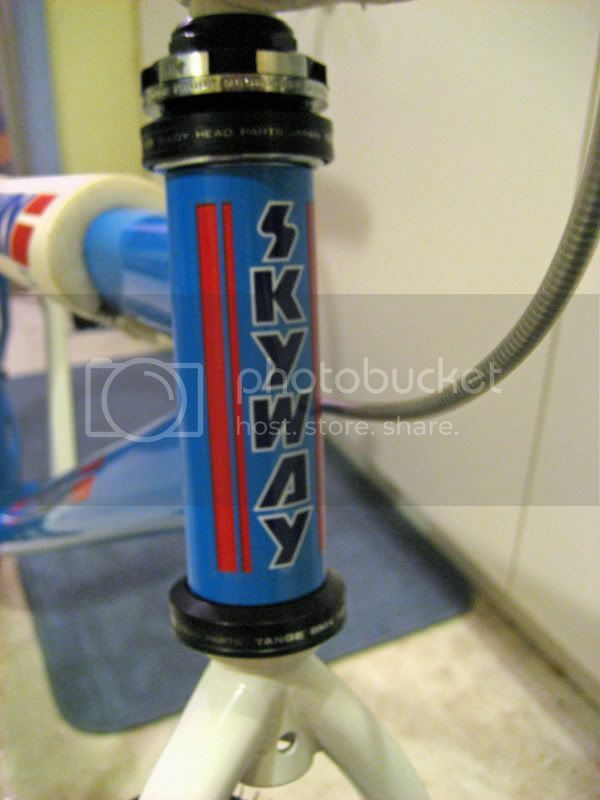 Nice Skyway the blue looks great!! 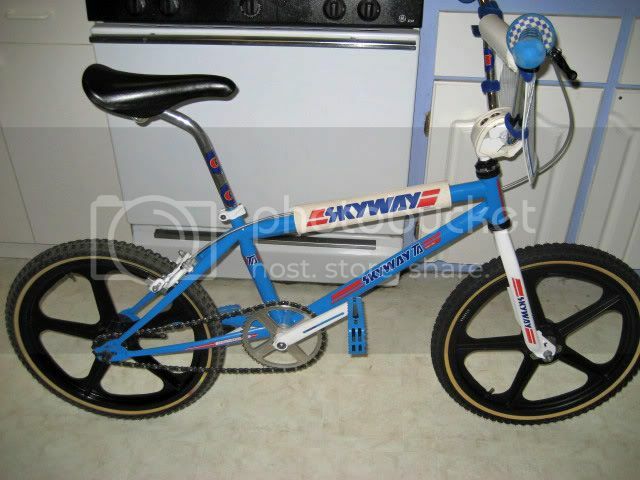 Ready to build my Skyway 24's!! !